DUARTE >> An East L.A. man is accused of kidnapping and domestic violence after witnesses reported seeing him force his girlfriend into a car in Duarte on Wednesday afternoon, officials said. Deputies first responded to the area of Millbrae and Central avenues about 1:45 p.m., Los Angeles County sheriff’s Lt. John McClure said. Witnesses reported seeing a man forcing a woman into a car before driving off. Deputies soon identified the possible suspect and headed to his home on Ferguson Drive in East Los Angeles, on the border between Commerce and East Los Angeles, McClure said. The man and the woman complied with deputies’ orders to come out of the home about 5 p.m., he said. The woman told deputies she had not been the victim of a crime, McClure said. But based on witness accounts, deputies arrested the man on suspicion of kidnapping and domestic violence. The suspect’s identity was not available pending the booking process. AZUSA >> Police jailed a domestic violence suspect already wanted for violating the terms of his AB109 felony probation after he led them on a chase in a pickup truck on Tuesday afternoon, authorities said. David Daniel Delgado, 28, of Azusa was ultimately booked on suspicion of domestic violence, evading arrest and resisting arrest, as well as in connection with the pre-existing arrest warrant, according to Azusa police Sgt. Xavier Torres. Police had been seeking him since Oct. 20, when officers investigated the alleged beating of a woman by her boyfriend, resulting in cuts, bruising and swelling to her face, Torres said. But the suspect was not immediately found. “Officers learned that Delgado was on Post-Release Community Supervision from a prior criminal offense, and that a no-bail warrant has been issued for his arrest for violating the terms of his early release, Azusa police said in a written statement. Officers from the San Gabriel Valley East AB109 Task Force began hunting for Delgado, Torres said. They spotted him about 4:50 p.m. on Tuesday driving a work truck in the area of Cerritos Avenue and Newburgh Street in an unincorporated county area just outside of Azusa. Delgado led officers on an 20-minute chase that came to an end when police used a Pursuit Intervention Technique, or PIT, maneuver to stop the fleeing truck, police said. “Delgado’s reckless driving clearly exhibited a willful disregard for the safety of others,” according to the police statement. The suspect continued fleeing on foot after police disabled his truck but was soon chased down and captured, officials said. According to county booking records, Delgado was being held without bail pending his initial court appearance, scheduled Thursday in the Pomona branch of Los Angeles County Superior Court. Under AB109, also known as California’s Public Safety Realignment of 2011, allows convicts convicted of “non-violent, non-serious, non-sexual” felonies to serve their sentenced in county jails, rather than state prisons, and be supervised by county parole officers upon their release, rather that state parole agents. Details regarding Delgado’s previous conviction were not available Wednesday due to technical issues affecting Los Angeles County Superior Court records. IRWINDALE >> Police arrested an ex-convict Sunday after he assaulted and carjacked a woman in Irwindale, then burglarized her Pomona home, officials said. 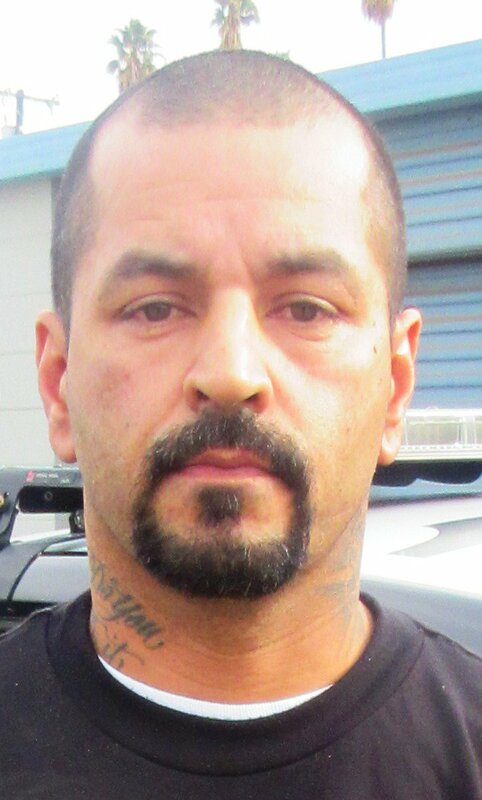 Officers ultimately jailed Jesse Maldonado, 45, of West Covina on suspicion of felony domestic violence, carjacking and burglary, Irwindale police Sgt. Rudy Gatto said. The series of crimes began about 12:30 p.m., as Maldonado, the 30-year-old mother of their child and their 12-year-old son were riding together in a 2006 Mazda 6 along Los Angeles Street near the 605 Freeway in Irwindale, Gatto said. Maldonado was at the wheel. The couple became involved in a dispute, and Maldonado pushed the woman from the vehicle as he continued driving it at about 10 mph, the sergeant said. The woman suffered minor injuries. Maldonado stopped the car and ordered the child out before driving off in the woman’s car, he said. The suspect then drove to the woman’s apartment in the 700 block of West 3rd Street in Pomona, where surveillance cameras snapped imaged of him breaking in, Gatto said. He stole various household items and fled the scene before Pomona police arrived. Irwindale police soon found Maldonado when he returned to their city to access a storage locker in the 4300 block of Irwindale Avenue, Gatto said. He was arrested without a struggle. Police recovered the woman’s car, as well as items from her apartment which were found inside the vehicle. Maldonado was being held in lieu of $100,000 bail at the Baldwin Park Police Department’s jail pending his initial court appearance, officials said. *This story has been updated to correct the relationship between the suspect and victim. Sounds like a mash-up between Crime Scene and Leftovers. Mayor Ernie Gutierrez of El Monte found himself in a bit of trouble Wednesday. He was arrested and held by cops in his own city on suspicion of spousal abuse. The story has angered several residents of El Monte, who believe Gutierrez received some sort of special treatment when the DAs office decided not to prosecute after a day long investigation. EL MONTE – Ernie Gutierrez, the mayor of El Monte, was arrested early Tuesday on suspicion of domestic violence and detained for most of the day, police said. The Los Angeles County District Attorney’s Office refused to bring charges against Gutierrez, whose term expires in 2009, El Monte police Chief Ken Weldon said. Gutierrez did not comment on the incident. Police did not identify the victim, or indicate how they received the complaint. Gutierrez was held by police while the District Attorney’s Office reviewed the case. He was released when officials determined there was insufficient evidence to charge him. Gutierrez was arrested about 2:15a.m. and was booked at L.A. County Jail, according to El Monte police Lt. Robert Roach.